Continuing in the vein of the Miriyummy tasting menu restaurant reviews, I’d like to tell you about the amazing meal Ju-Boy and I had at Jamie Oliver’s flagship Fifteen restaurant in London. It was amazing! 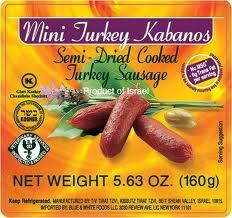 Who knew unkosher food could be this delicious? Most people go through life with only one mother. I feel sorry for them, in a way. It’s wonderful to have a loving mother who nurtures you, loves you, spoils you… But what’s even better is two women who would do this for you. 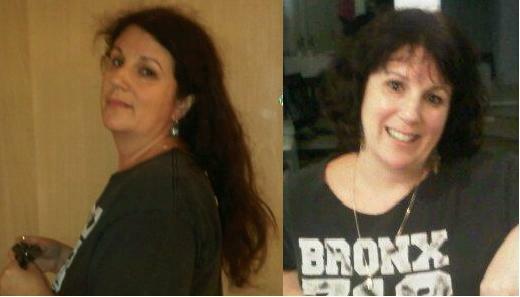 I’m fortunate to have been blessed with two mothers. Okay, we’re not even going to go into the whole adoption issue, that’s doesn’t even enter into the equation here. First, there’s my mom. She may not have carried me under her heart for nine months, but she brought me home from the hospital, and that’s my mom. When I was seven we spent a considerable time in Norway, and my Aunt Zipora, my father’s baby sister, came up from Israel to visit us. My father had told me stories about all his brothers and sisters back in Hungary, and I was thrilled to meet the aunt he spoke of so fondly. She brought me a book in Hebrew and we spent a lot of time reading the stories together. When I was 16 we came out to Israel for the summer, for my brother’s Bar Mitzvah. I was a rebellious teen, and you could have imagine just how embarrassed I was by my mom. She kept trying to get me to pose for pictures, she kept trying to buy me dorky clothes, she kept trying to keep me safe. How embarrassing! My Aunt Zipora, on the other hand, convinced my mom to let me go off to the beach by myself. She bought me the sandals that were the “in thing” back in 1979 Tel Aviv, and she taught me curse words in Hungarian! 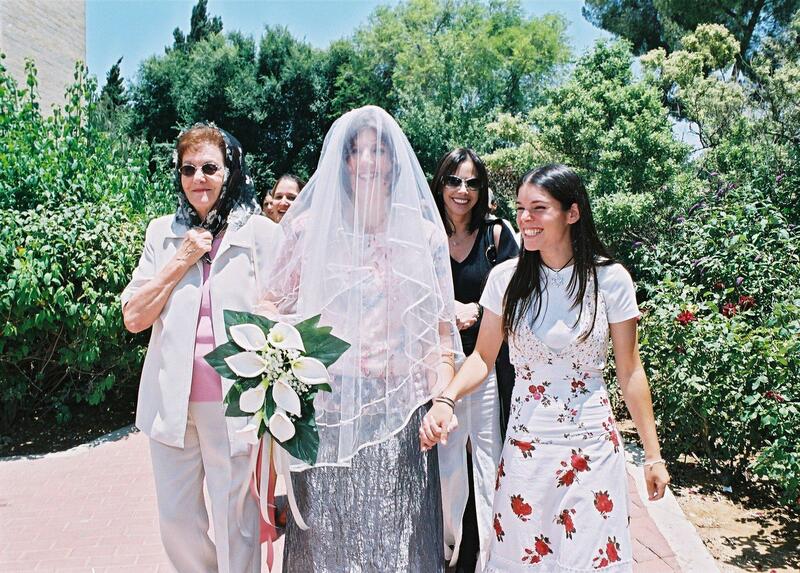 Throughout the years, while I was in Israel as a kibbutz volunteer, a university student, a new immigrant, a new mom, a new divorcee, my Aunt Zipora was always there to support me in any decision. She became like a second mother to me. Since my girls didn’t have grandmothers who lived nearby — my mother lived in New York, their other grandmother in London — Zipora became a grandmother to them. 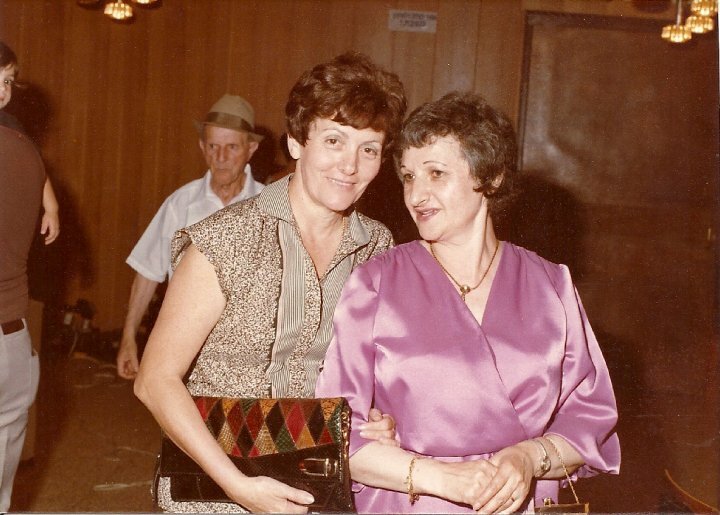 When my father died in 2002 I went to the States for the funeral, and after my mother and I comforted each other I flew back to Israel and my aunt and I had another good cry together. 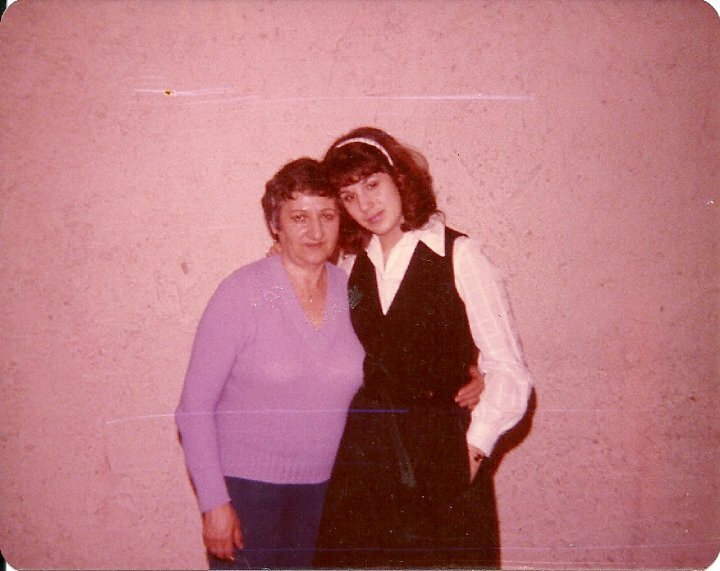 When my mother died in 2009 my aunt was there to tell me stories of my parents’ early life together, pre-Miriyummy. In 2005 I married for the second time. My mother couldn’t come out for the wedding, so I had the oddest pleasure in being walked down the aisle to the chuppah by my oldest daughter Sassy and my Aunt Zipora. This dish went by the name of káposztás tészta. 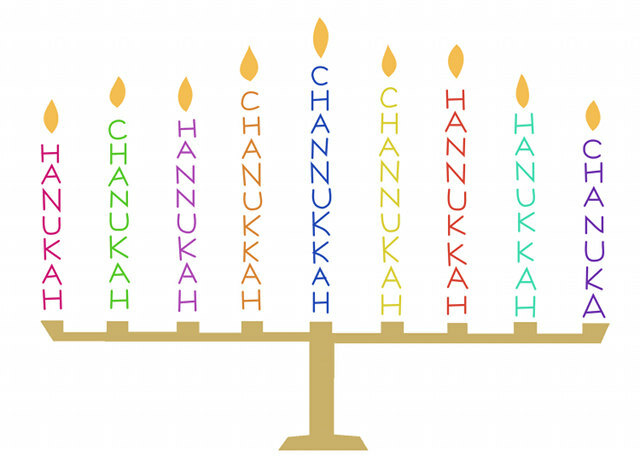 I never managed to pronounce the second word correctly, and it all got shortened to Capostash when I put it into our Shabbat rotation. No one else seems to want to call it that, so Hungarian Noodles it is. Purists will rise up in outrage when they read what I’ve done to the recipe, but this is my blog, and my bastardized recipe, and I’m serving it at my table, so this is my Capostash! 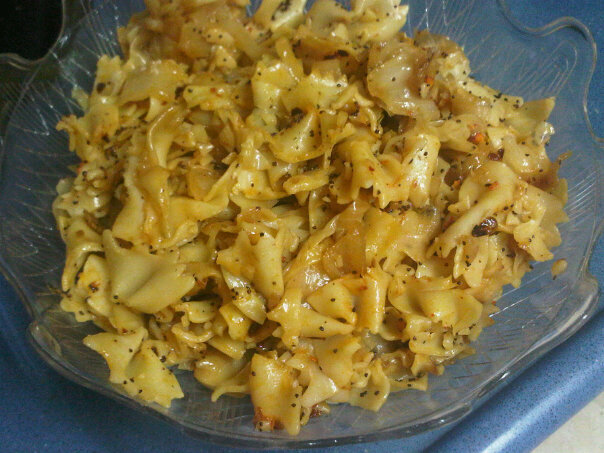 Leave out the shmaltz and the kabanas to make this dish vegetarian/vegan. 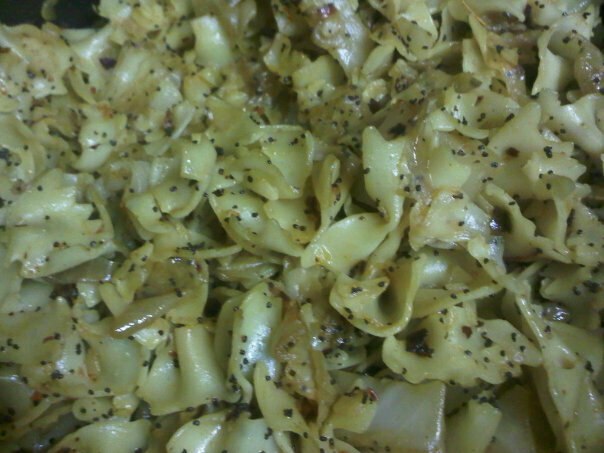 Caramelize the onions in the olive oil or shmaltz until darkly golden and soft. Add the cabbage and toss together with the onions until softened. Add the noodles and mix. You may need to add 1/4 – 1/3 cup of water to get it mixable. Add the salt, pepper and paprika and taste. When you have it juuuuuust right, add the poppy seeds and mix together. (Add the kabanas.) Serve hot. If you add the cut up kabanas it takes this dish to a whole new level. It’s not authentically Hungarian, but it’s authentically delicious! One of the things I love about Judaism, and being Jewish, is the subjectivity of it all. Yes, there are rules that say do this, don’t do that, but there is also a lot that is open to interpretation. How you go about your relationship with God, your relationship with your family and your community is left up to you. Within the circle you have chosen to live in, your religion is your own. Growing up in my parents’ house I was shown both side of the religious coin. 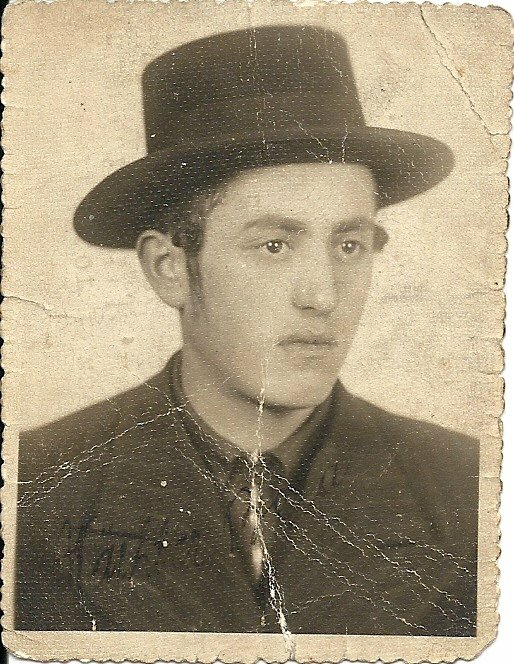 My father grew up ultra-Orthodox, he had the requisite peyot (side curls), the right intonation when he prayed and he was a rabbi who taught small children to love the Torah. He lived in a small village in Hungary where everyone knew everyone else. And then his entire world was ripped apart. He lost his family, he lost his community, his livelihood, and as the Holocaust did to so many, he lost his religion. He took off his hat, cut off his peyot, and lost his faith in God. My mother, on the other hand, grew up in a home that didn’t have the relationship with God that my father had. My mother grew up in a secular household, where there was a Jewish tradition, but as they say, it was more of a guideline than a rule. She lived in Vilna, the capital of Lithuania and the center of Litvak culture, a cosmopolitan town. And then her entire world was ripped apart. She lost her family, she lost her childhood, and she lost her trust in everyone, especially in God. 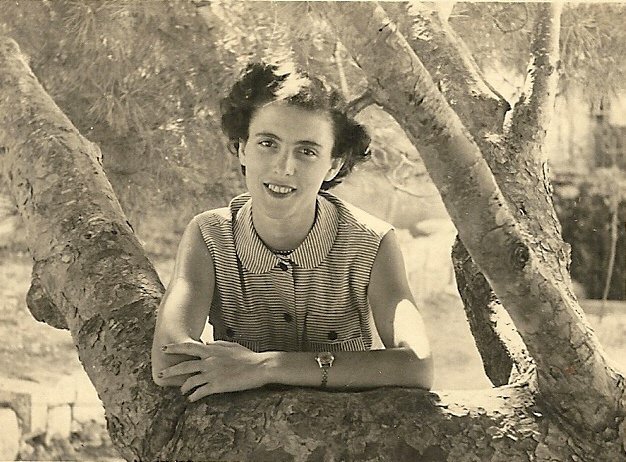 The Nazis did such horrible things to my mother, that when she was liberated she was malnourished, ill, and would never be able to have children. She and my father were both refugees in Sweden. How they met has become family legend. My mother was keeping house for my grandfather, a furrier. My father was living with his 4 surviving brothers and sisters and they decided to get my Aunt Toby a fur collar for her coat for her birthday. My father was the one who stopped by my grandfather’s house to place the order. He saw a picture of my mother on the hall table, and my grandfather couldn’t help but boast of his daughter who took care of him and cooked him the most amazing meals. My father was told to come back a week later… which he did… at dinner time. My parents were married a year later. For 13 years they took the ashes of their lives and rebuilt them into a life together. 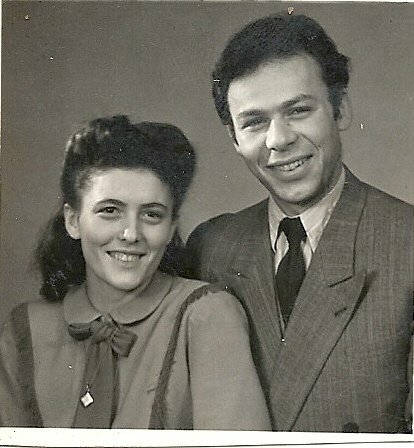 They immigrated to the States in the late 50s, and then, one day, I arrived in their lives. The adoption of a daughter changed them forever, and my father, who had lost his faith, found it again. But my mother, who didn’t start out on the same page religiously, was not ready to follow. My father let her be, and she let him be. I grew up in a home where religion, as well as secularism, was not only tolerated, but respected. 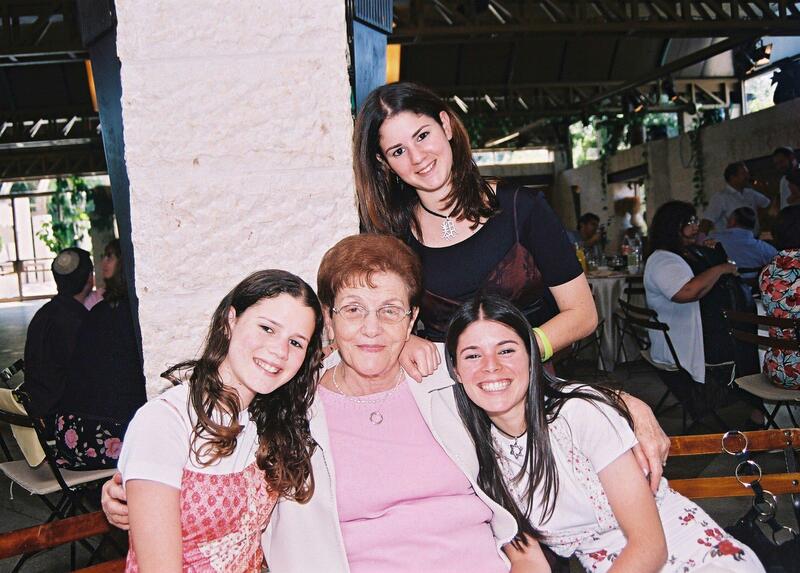 My mother kept a kosher home for my father, and he let her live her life in the way she felt she needed to live. I have very interesting memories of my mother making the blessing on the Shabbat candles, and then lighting her cigarette off those very candles. There are those who will be shocked at this, but in our house, that was how we all got along. What happens when two irresistible forces meet? The forces can’t resist each other, so they combine into one irresistible force. This irresistible force became our family, and the interpretation of religion in the end always centered around the table. My mom was the most amazing cook, and no matter how you felt about God, Judaism or life in general, her dinners took you to heaven. 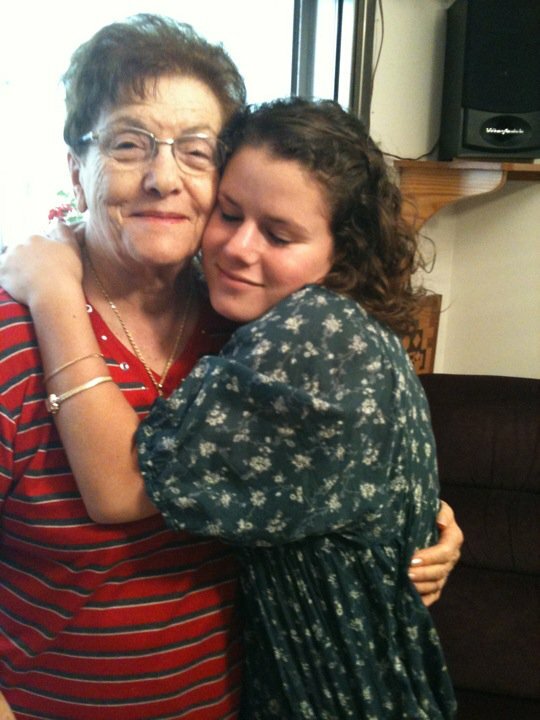 This past Shabbat was the first yahrzeit (anniversary) of my mother’s death. 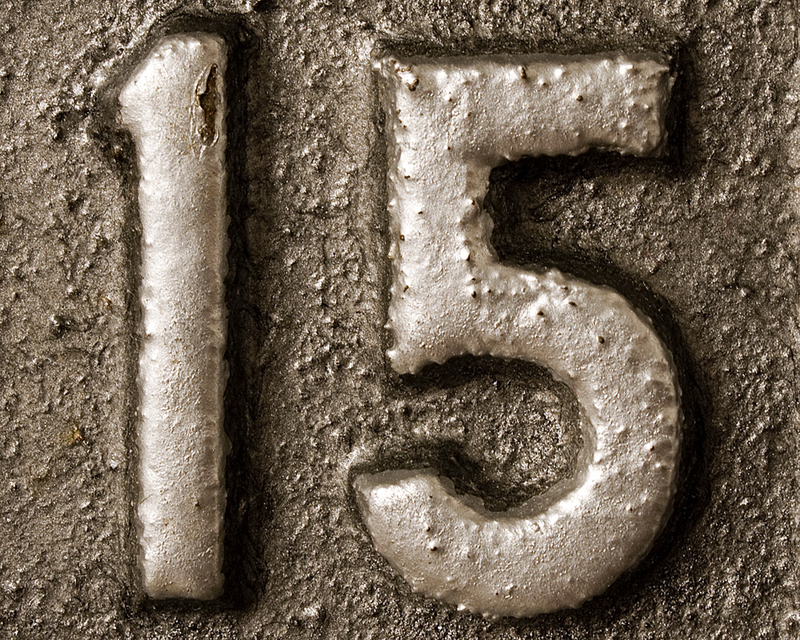 I’ve written before how I’ve subjectively taken this year of mourning to be meaningful to me. My father died eight years ago and every year on his yahrzeit I celebrate his life with a Hungarian dinner. This year, the first yahrzeit for my mother, I cooked a dinner in her honor which I hope would make her proud of me. We had good friends over for dinner on Friday night, my daughters Tinky and Didi were there, and Ju-Boy gave a wonderful speech about a woman he never met in life, but knew so well through the love of cooking she passed on to me. He mentioned how the irresistible force of my father’s faith and the irresistible force of my mother’s lack of belief met together to create an irresistible force of respect. My father taught me to love books, my mother taught me to love cooking (and feeding), but together they taught me to respect your partner, your children, your family and your fellow travelers in life. My mother served this at least every other Shabbat. The wonderful nutty flavor of kasha (buckwheat) will always bring me back instantly to the warm Friday night table, candles lit, my father making kiddush on annoyingly sweet wine and my mother hovering over the stove, ready to serve up her amazing food. I suppose you could say she found her religion in the kitchen. Heat the oil in a large, heavy pot. Add the onions and cook over medium heat, stirring often, until brown and caramelized, about 15-20 minutes. Transfer to a bowl and cover to keep warm. Do not clean the pot. Combine the kasha with the beaten egg until completely coated. Heat the pot over medium heat and add the egg-coated kasha. Keep stirring to keep the grains separate and cook for about 3-4 minutes until the kasha becomes dry and toasted. Add the chicken soup and stir. Add the salt and pepper to taste. 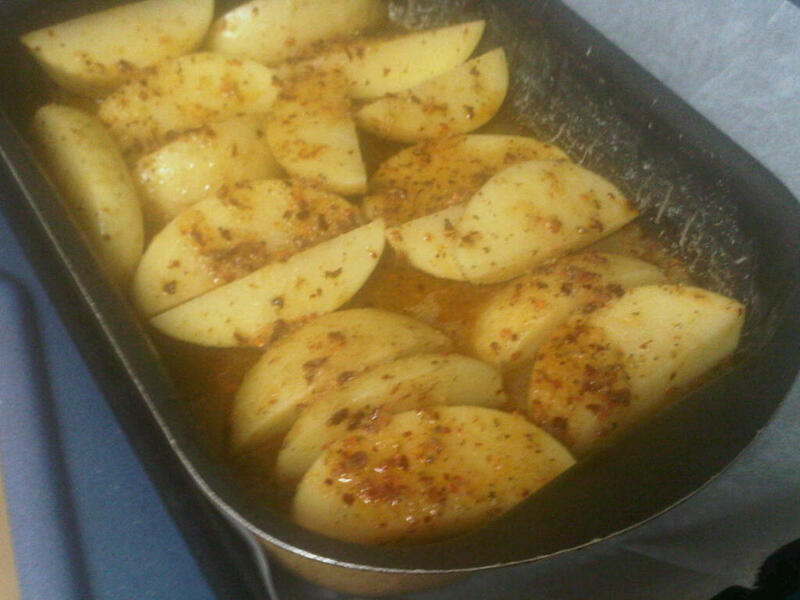 Lower the heat and cook for about 10-15 minutes until the kasha is tender and all the water has been absorbed. Stir with a fork to fluff. Add the onions and mix well. Add in the cooked bow ties. Toss well and serve. I gave up many thing when I married Ju-Boy. I gave up the Jerusalem mountain air. I gave up quiet streets and living in a town with no stoplights. I gave up a certain amount of my independence. What I feel the most, however, is that I gave up my friends. 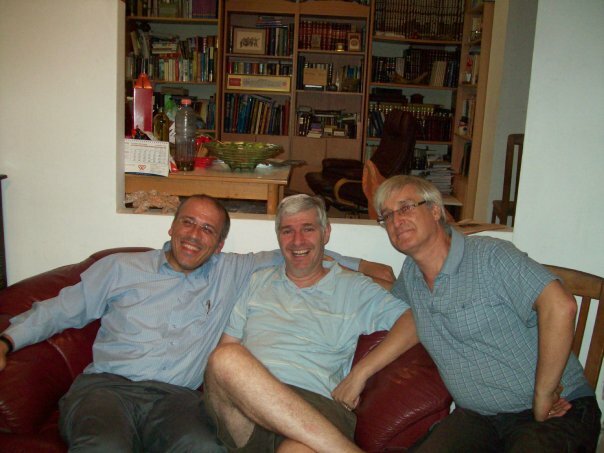 Okay, they are still my friends, but because I now live a one-hour’s drive away (long distance in the Israeli psyche), I don’t get to see them often, or at all. 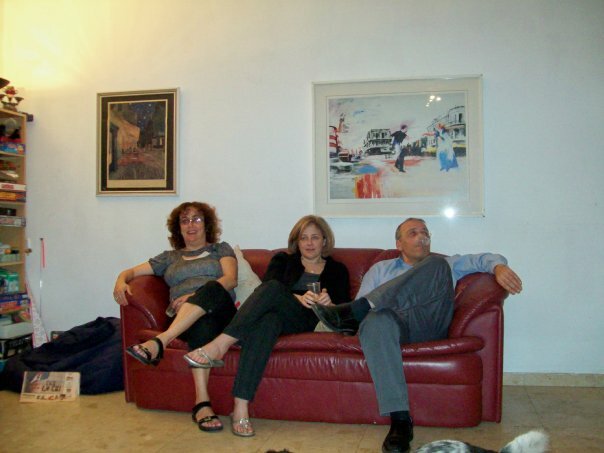 I don’t get to bump into them at the grocery store, wave to them as I take my evening power-walk (oh yeah, I also gave up power-walks), I don’t get to exchange gossip outside the synagogue, and I don’t get to just hang out with them, either at the Shabbat table or for a coffee evening during the week. I miss them. I gained many things when I married Ju-Boy. I gained a house with stairs (my first time living in a house, not an apartment). I gained living in a somewhat cosmopolitan city with a main street full of fun shops. I gained the Cooking Channel (the X said we couldn’t afford it because we were already paying the cable company a ton for all his sports channels). I gained the use of Ju-Boy’s amazing turbo oven, and I gained his friends. When we spoke about them I used to call them “your friends,” and he would always correct me and say “our friends.” But, tachles, they started out as his friends, and I then began to refer to them as my friends-in-law. Regardless of the fact that I even knew some of them longer than he did, they were his friends. But little by little, I have taken over. Shar calls on the phone and Ju-Boy is ready for a chat, but she wants to speak to me! Yummy Mummy calls my cell phone for the Shabbat meal invitation. Most of them read my blog, but how many of them even know he has one, huh? 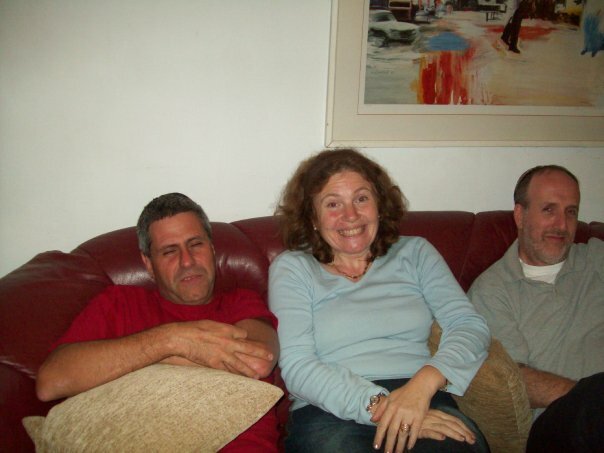 I like his, erm, my friends, they’re good people, and they make sure that with all the hustle and bustle of busy families, smachot, grandchildren and life in general, that we still get together for a laugh. 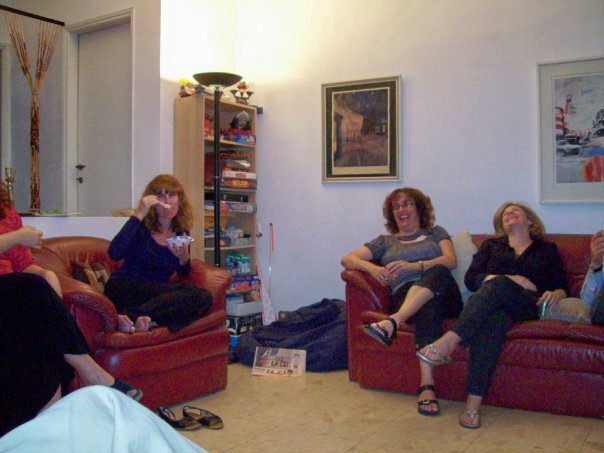 We make sheva brachot celebrations together for our children, we try to go away together for a Shabbat here or there, we drink Marc’s whisky and eat Yummy Mummy’s cake creations. We’re in and out of each other’s houses on Shabbatot for meals, and a few times a year we get together for holiday potlucks. So it’s erev chag and I have four dishes to make in two hours. I didn’t get a chance to make any the night before because we were out late (visiting one of my, erm, our friends from my Jerusalem days), and that morning my boss decided he needed just one more email, just one more thing, just one more… aaaaaaarrrrrrrgggggghhhhhh! I got home from the office, saw the mess in the kitchen, the mayhem in the rest of the house, and that’s when I went headless chicken! if you do something like a headless chicken, you do it very quickly and without thinking carefully about what you are doing (usually in continuous tenses) I’ve got so much work to do – I’ve been running around like a headless chicken all week. He was racing around like a chicken with its head cut off trying to do the work of two people. One of the great miracles of Judaism is that no matter how early or how late the holiday or Shabbat starts, you are always ready at the last minute. Amazingly, everything got done on time, and when I lit the candles and ushered in the final holiday of the season, the house was relatively calm, I was relatively calm, and even the floors were clean. That night it was just the family for dinner, the quiet before the storm. I first tasted this at my (our) friend Shosh’s house back when I lived in Givat Ze’ev. I politely took a portion, then seconds, then thirds, this was yummy! I got the recipe, and over the years it’s evolved to what it is today. Pour the couscous into a large bowl. Mix in the soup powder and olive oil, stir well to combine (I use a fork). Add the boiling water and let soak until all the water has been absorbed. 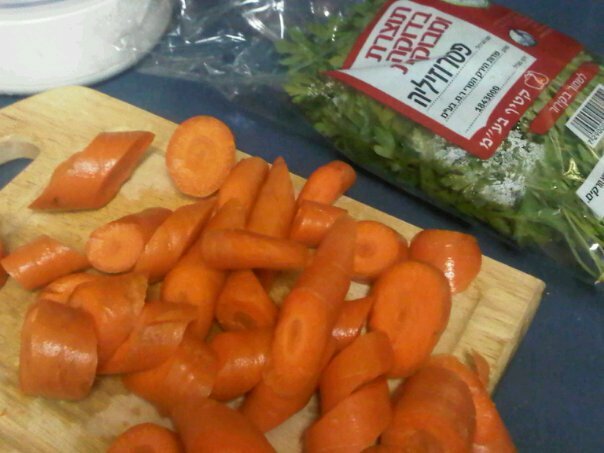 Place the carrots and parsley in a food processor (steel knife). Zest the lemon with a Microplane and add it to the food processor. Process until a minced finely. Add the juice from the lemon, olive oil, ginger and pepper. Process until a paste has been formed. 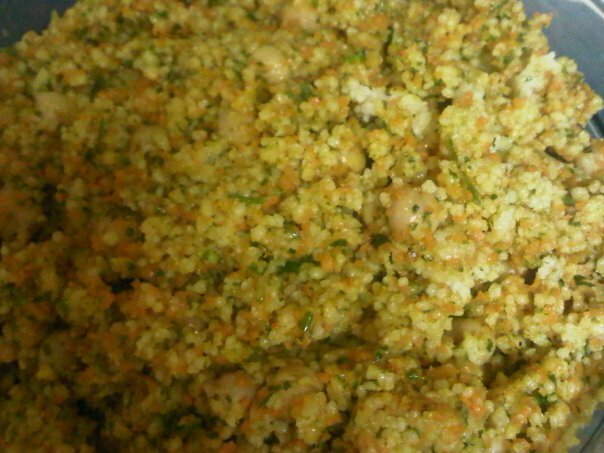 Add paste to the ready couscous and mix together. Add the chickpeas and mix together. Turn into a salad bowl and chill for at least two hours. This is a great dish to serve on Saturday lunch, or to take to a potluck with 50 of your best and newest friends. Some women have a thing for tall men. Others have a thing for men with curly hair. And then there are those women who go for muscles. Visual stimuli, works for some, but not for me. For me the attraction is aural. If you’re having trouble figuring that one out, or keeping your mind out of the sewer, look it up. Okay, back to my aural fixation… I have a thing for English accents. It’s an illness, really. It all started in the 7th grade, when Miriam Greenblum beckoned me into her bedroom and said, “You have to listen to one of my sister’s records, it’s so cool!” The record was The Beatles’ Magical Mystery Tour, and at that point my life changed forever. I fell in love first with their music, then with them (predominantly George Harrison), and later on, when I saw their movies, with their accents. I didn’t realize that they had working class Liverpudlian accents, I just loved listening to them talk. I started watching any BBC production I could on public television. Monty Python’s Flying Circus, Fawlty Towers, The Good Life, To The Manor Born, as long as they were speaking with that accent, I mopped it up. But man plans, God laughs. While I ooohed and aaaahed over his accent, he did have this habit of correcting my pronunciation. When I would ask him if he wanted some tomato in his salad, he would not answer yes or no, but would say tomahto. He uses a tis-you. He keeps to a she-jew-al. It’s a tiny bit irritating, or, as he would say, it gets up my nose. But still, I love to listen to him, even when he rolls his eyes when I’d ask him if he wanted a banana (he’d say no, he didn’t, he wanted a ba-naaaaah-na). Finally, I confronted him. “Do you want me to sound like Madonna after she moved to England? Do you want me to tawk to you in my Bronx accent? Yo! Ju-boy! Ya wanna tomahto? Would you care for a spot of cawfee?” He got the point. And we continue to live happily ever after, for the moment. Oddly enough, in spite of the Gershwin lyrics, the Brits also say potayto. Does it matter? I’m getting hungry discussing this. 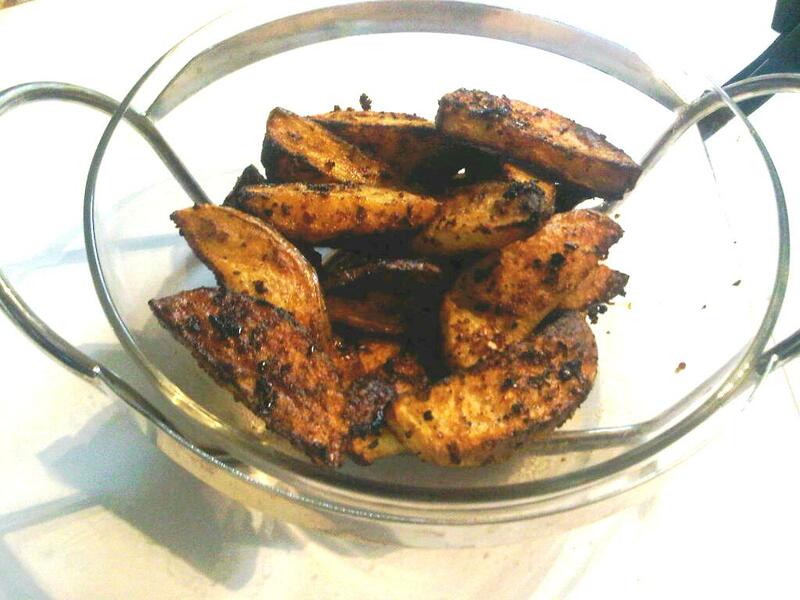 Which leads us to part of what’s for supper tonight, Golden Herbed Potato Wedges. You can find the recipe on one of my favorite blogs, Israeli Kitchen. Full of wonderful recipes, this blog is always a source of mealtime inspiration.